Brachycephalic: Defined as a skull that is broad and short. Examples include English Bulldogs, Pugs, Boston Terriers and Shih Tzu. Stenotic nares: Nostrils that are more narrow than normal. When the nostrils are narrow, the tissue in the nose will tend to collapse during inhalation, which results in your furry friend having more difficulty breathing through its nose. Approximately 50-85% of dogs with BAS will have stenotic nares. Elongated soft palate: Since a brachycephalic dog has a shorter (or more squished face), this means that all the tissue in the face, mouth and nose has to fit into a smaller than normal area. As a result, the soft palate (tissue on the roof of the mouth that divides the back of the nose from the back of the mouth) will loosely hang in the back of the mouth, often partially covering the windpipe opening. When a brachycephalic animal is breathing, this tissue flaps in the windpipe opening, creating the commonly heard “snorting” sounds. While these snorting sounds are adorable, it can also sometimes be an indication that your brachycephalic buddy is having to work harder than necessary to get oxygen into its lungs. It is estimated that approximately 90% of brachycephalic dogs have an elongated soft palate. Everted laryngeal saccules: A condition where tissue located in the upper airway, just in front of the vocal cords, is everted (pulled outward) into the trachea and partially obstructing the airflow to the lungs. Hypoplastic trachea: The trachea is commonly known as the windpipe. A common congenital (from birth) condition in a brachycephalic dog is a hypoplastic, or narrower than normal, trachea. This means that a 50 lb. bulldog with a hypoplastic trachea will have a windpipe normally expected in a 20 lb. dog. While there is no treatment for a hypoplastic trachea, treating the other components of BAS can significantly improve your squished-faced friend’s breathing, even if it does have a narrow trachea. What can be done to help my brachycephalic breed? Fortunately, most dogs do not suffer from all aspects of BAS, but discussing these traits with your veterinarian is recommended. While there is no treatment for a hypoplastic trachea, the other components of BAS can be treated surgically, if indicated. Stenotic nares can be widened through a surgical rhinoplasty, decreasing the resistance to upper airway flow and making it easier for your dog to breath. Furthermore, the elongated soft palate can be surgically shortened (or trimmed) with a procedure called a palatoplasty. Finally, the everted laryngeal saccules can be surgically excised. BAS surgery can be performed as young as 4 months of age and earlier intervention can be key in helping your furry friend to live a long and energy filled life. Limit exposure to extreme temperature (especially high temperatures) and provide your pet with a comfortable, cool environment. Brachycephalic breeds are not well equipped to handle the heat, so on hot summer days limit time outside to bathroom breaks and very short walks. Also provide access to cool, fresh water and a room with good ventilation, air flow and shade. It is not recommended to leave brachycephalic pets outside unattended in the warm spring and summer months as they are at higher risk for heat stroke. 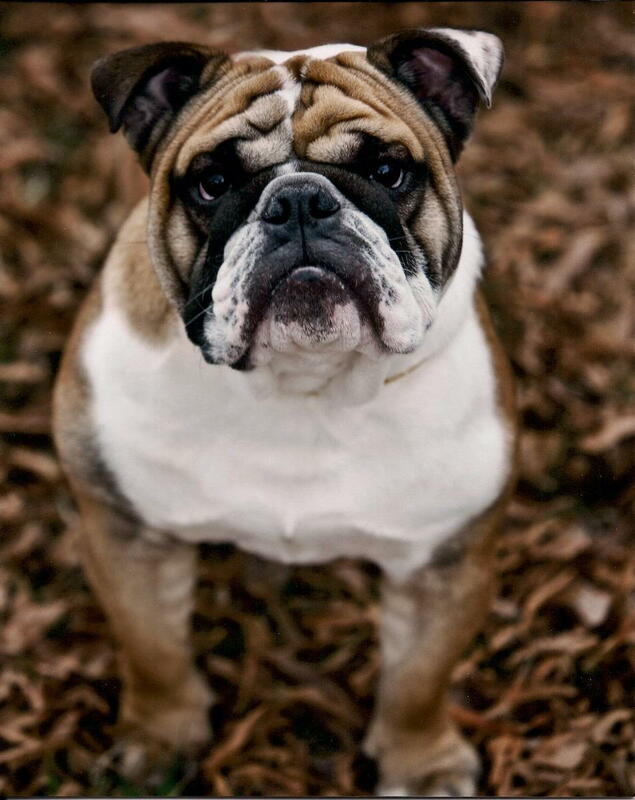 As the owner of an English Bulldog, Deacon, I have personally experienced the stress and precautions that must be taken when owning a brachycephalic breed. Deacon has been a part of our family since we was a young puppy, but around one year of age we noticed that he was snoring louder than normal and seemed to be breathing heavier after short periods of play. After evaluation, Deacon was determined to be a good candidate for brachycephalic airway surgery (rhinoplasty and palatoplasty) and we proceeded with surgery. Surgery took less than an hour and the benefits from surgery were immediately noticeable. In his recovery cage, Deacon was heard softly snoring rather than the loud, raspy snores and breaths he was taking before surgery. Deacon quickly recovered from his surgery and since then he has been a happier, healthier and more energetic Bully. Do you own a brachycephalic dog? Contact the Animal Hospital at Lake Brandt to schedule an evaluation with one of our veterinarians to see if your furry family member would benefit from BAS surgical intervention today.